George Lucas once had a vision for his own “Star Wars” sequel trilogy, and he told actor Mark Hamill his plan for the finale. Hamill said that Lucas intended to kill Luke Skywalker in Episode 9 after he trains Leia in the ways of the Force. Luke instead dies in Rian Johnson’s “The Last Jedi,” Episode 8, after he becomes “one with the Force” to save Leia and the Resistance. A long time ago, in a galaxy far, far away, George Lucas had plans for a “Star Wars” sequel trilogy. That obviously never happened, and we now have different versions of Episodes 7 and 8 – with 9 coming next year – than what Lucas originally envisioned. But thanks to Luke Skywalker himself, we now know how Lucas would have ended Episode 9. 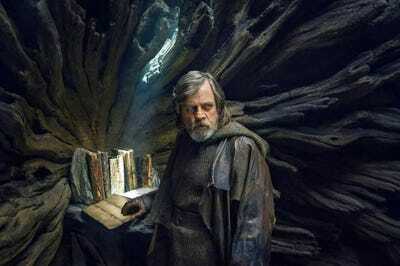 In an interview with IGN, actor Mark Hamill revealed how Lucas would have ended his own Episode 9, and it’s similar to how director Rian Johnson ended Episode 8, “The Last Jedi,” last year. Hamill told IGN that Lucas intended to kill Luke Skywalker. In Rian Johnson’s version, Luke dies at the end of “The Last Jedi” after becoming “one with the Force” to save the Resistance in a stand-off with Kylo Ren and the First Order. Luke uses the last of his energy to Force-project himself into battle with Ren and buy his sister Leia and the Resistance enough time to escape the First Order. Instead, Luke spends the majority of “The Last Jedi” begrudgingly training Rey on an island. And Carrie Fisher’s death in 2016 has changed any Episode 9 plans for Leia.